Everyone wants to see cherry trees this spring but nobody wants to fight the crowds converging on the Tidal Basin - especially DC residents. The question is, where can you enjoy the beauty of the cherry blossoms without encountering massive crowds. Fortunately cherry trees are planted across the City in public parks, along streets and on private yards for you all to enjoy with some sort of peace and quiet. Casey Trees even has a clever online tool - Casey Trees Map - that allows you to locate cherry trees on National Park Service property and those that Casey Trees has planted. You can even add cherry trees that you have planted to the map so they can be counted towards the City's Urban Tree Canopy Goal of 40 percent by 2035 and so others can enjoy them. Now lets hunt cherry trees. 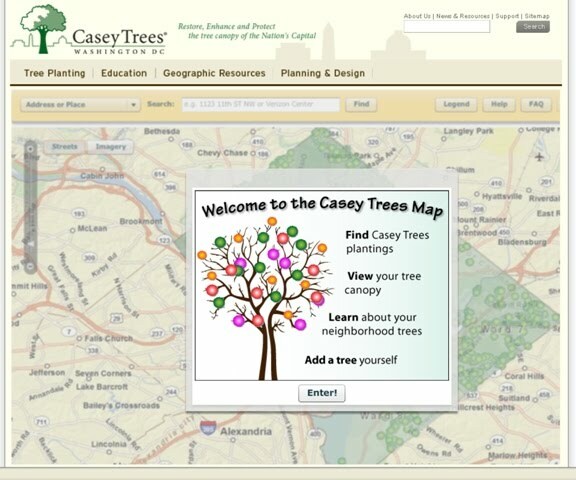 Hosted under the Geographic Resources/Interactive Maps and Tools page on the Casey Trees website, the Casey Trees Map puts the locations of cherry trees across the District at your fingertips. Hains Point, located in East Potomac Park is a 300+ acre peninsula located between the Washington Channel and the Potomac River on the south side of the Tidal Basin. Here you’ll be able to enjoy the reflections of blossom in the water without a competing mob (or at least a smaller mob). The National Arboretum may seem like an obvious choice but with 446 acres of trees, shrubs and flower, the location allows for more flexibility (and space) when it comes viewing the trees. Plus the 70+ Cherry Tree types that grace the area guarantee some variety. 3501 New York Avenue, NE, Washington, DC 20002. Anacostia Park offers another place to view the blossoms in a less commercial area. The park, located at 1900 Anacostia Drive, SE, is a stretch of 1,200 acres with shoreline access and recreational activities. Foxhall Village, situated near Georgetown may be the best-kept cherry blossom viewing secret in the District. The colorfully lined street around Foxhall and Reservoir Roads, NW make for the perfect walking and viewing location.